"The build-up to Christmas is a busy time. There are presents to buy, parties to attend, food to prepare, cards to send and relatives to visit. So it’s easy to forget about Jesus, even at Christmas—especially at Christmas. But the truth is that we’ll never enjoy Christmas properly unless we understand who it is who was born in Bethlehem that night. Indeed, we won’t enjoy life to the full until we see God in a manger." If you’re looking for a fresh, creative, insightful, and thoroughly biblical and Christ-exalting guide for Advent, look no further. 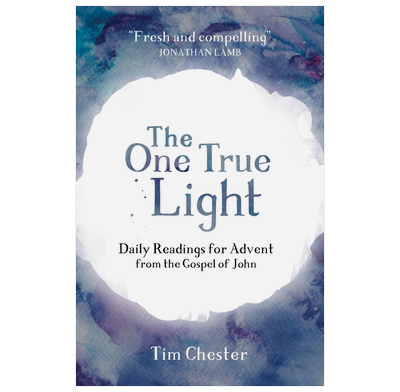 Tim Chester’s book, The One True Light, applies biblical theology to the first 18 verses of John’s gospel to show us how the Incarnation affects every aspect of our lives. Brief and simple enough for children, yet deep and rich enough for mature Christians, this is a book that inspires awe, wonder, and praise for Emmanuel, God with us. Most of us struggle to keep the main thing the main thing – and at Christmas, even more so! In this advent devotional Tim strips away all the unnecessary distractions and helps us focus on Christ. Journeying daily through John 1 we catch a fresh glimpse of Jesus and are invited into a deeper relationship with him - essential if we are to recapture the true meaning of Christmas. A super series of short meditations introducing the Jesus who brings us into the loving arms of his Father. All warmly illustrated with stories from life about problematic plumbing, Chelsea Football Club, enjoying the sky at night, the city of Sheffield and fist-fighting bishops! We bought this on recommendation from a friend as a home-group daily reading this Advent and it has been well received. Chester links the passage wonderfully to the rest of the bible to draw out different aspects of the Saviour, and His relationship with the rest of the godhead and with us. We benefitted from it as believers but Chester has written it so that non-believers can read and understand too. So helpful. We studied this is a house group December 2017, and we have found it truly wonderful. Tim writes in an easy to read style, with the chapter per day being not too long to keep up in the busy life that is December. Two main things came out of the study: truly understanding the iconic word that is John 1, that we’ve heard so often over the years but if we’re honest been slightly confused by! And secondly Tim brings alive the lyrics from many classic Christmas Carols, the words we have just belted out for years now have true meaning. So advent is so much more than calendars and a countdown. I would recommend this book. Every day in advent there is something to think about that is relevant and poignant. I have tried many other advent readings in the past and this is the only one I've managed to stick with throughout the season because I found it short and to the point. Have always been a Tim Chester fan! Am buying more copies for friends for next advent. We read through this as a family in the run up to Christmas. It's very readable and engaging and helped us to focus on the real meaning of Christmas from the beginning of John's gospel. I really enjoyed this advent series. It was just the right length for these busy days. The specific focus each day on key phrases or verses in John 1, helped to highlight just how wonderful was the Gift given to us in the Word made flesh. It also brought to life many of the words in our carols which we tend to sing with too little thought! The prayers too were full of rich meaning. Altogether a very good way of focussing on the only message of Christmas. I would definitely use this book again. This is a very easily read book which has chapters of ideal length and ideal depth for a daily devotional. A group of us read it together in the church to encourage us with our quiet times in the run up to Christmas and found it very helpful. Every chapter/day ends with a brief meditation and prayer which fitted in with the teaching of the chapter. The main material itself I found well written, insightful and thought provoking. The language used was fresh, for instance talking of the world in terms of being broken and Jesus coming to mend it. Although the chapters are all based on John 1:1-18 and opens up that section of John well, the frequent reference to other Bible passages, such as Gospel stories and Old Testament narratives I found very helpful as it gave me knew insights into them also. For instance the description of the Tabernacle being "an echo back to Eden and a pointer forward to our true home" was really helpful. As was the explanation of Jesus about to pass by his disciples on the lake before getting into the boat with them. It would be difficult to pick out one key thing about this book, as it's packed with good, nourishing theology made accessible. But my favourite quote was, "The word "advent" means coming...At his first advent, Jesus came to be where we are. At his second advent, he will come so that we can be where he is" (p98). I would have no hesitation recommending this book. Great read which lifts up Christ and stokes up the fire in the believers heart. Really short, helpful notes on the passage that have helped me refocus on the real Christmas. I particularly found the meditations (often well known Carols) and prayers useful to dwell on throughout the day. I bought 5 and gave them to lovely friends who all enjoyed them. Our Church was encouraged to read this through Advent. What a treat this has been - we also did a sermon series on John 1. Everyone has been encouraged by it - enjoying both the simple layout and also feeding on the wonderful truths. My wife and I read Tim Chester's exposition of John1:1-14 together. We found our minds and hearts warmed by his concise paragraphs. The gospel theology in the book stimulated and prayers and praises.